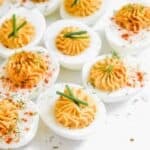 This deviled eggs recipe is quick and easy, with variations for different flavors and presentation – and has a bit of a kick! An appetizer that will disappear first at parties, this recipe is naturally gluten free, with paleo and Instant Pot options. Bring a medium-sized pot of water to a boil – you want enough water to cover the eggs by about an inch. Once the water has come to a boil, reduce the heat to low and use a slotted spoon to gently add the eggs to the pot. Once all the eggs have been added, bring back to a boil and set a timer for 12 minutes. While the eggs are cooking, fill a large bowl with cold water and a good amount of ice. Set aside. When the eggs are done, remove from heat and carefully use a slotted spoon to transfer the eggs to the ice water bath. You want the eggs to be cool to the touch, so let them chill out for 5-10 minutes. Once cooled, carefully peel the shells off of each egg and place the peeled eggs on a plate or platter. I like to pat them down gently with a paper towel to remove excess moisture and make them easier to work with. Slice each egg down the middle lengthwise. Remove the yolks of each egg and place them in a medium bowl. Tip: I just hold each egg half upside down over the bowl and gently press the back to pop the yolk out and into the bowl. Add mayonnaise, mustard, vinegar, pepper, salt, paprika and chili powder and use a fork or whisk to completely combine. It might not be 100% smooth, but that’s okay. Fill a piping bag prepared with a star pastry tip with your yolk mixture, and fill each egg half. Note: You can also use a ziploc bag with the corner cut off and prepare with the same tip, or just cut the corner and not use any tip at all – it’s just a matter of what presentation you’re looking for. Top with smoked paprika, freshly chopped fill, chopped chives, all of the above or none of the above! Serve and enjoy. Storage: Can store covered in the fridge for up to 3 days (just wait to garnish until serving), but best served same day. Substitution: You can also substitute the white wine vinegar and chili powder for 1 tablespoon pure horseradish. Instant Pot directions: Instead of boiling eggs on the stove top, use your Instant Pot! Place the rack that came with your IP in the bottom of the pot, pour 1 cup of water into the pot, and place your eggs on the rack. Cover and set to high pressure on manual for 5 minutes. Let it naturally release for 5 more minutes, and then carefully turn the quick release. Once all the steam has been released, uncover and carefully remove the eggs from the IP and place them in the ice water bath and prepare the rest as directed above. Paleo recipe: Not a big difference – just need to be careful of the type of mayo (check the ingredients – avocado oil mayos tend to be okay) and omit the white wine vinegar – same directions.